In Cheektowaga, Sunday was officially Anna Maria Anders Day. 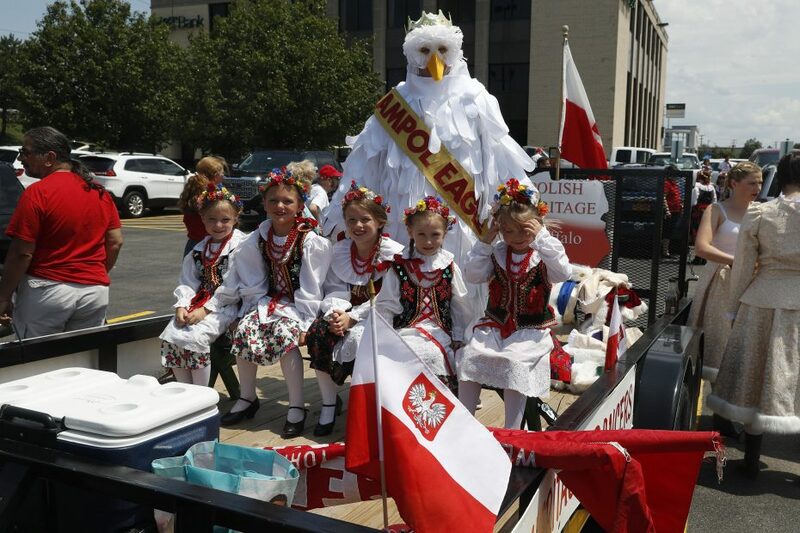 Anders, Poland's secretary of state, was one of five honorary grand marshals in the 79th annual Pulaski Day Parade held in conjunction with the Cheektowaga Polish American Festival. About 300 people, most dressed in red and white in honor of the Polish flag, participated in the parade. "I'm going to go back to Poland and tell them that Buffalo is the tops," Anders said. "The best people. The best Polonia. And we absolutely have to work together." More than 24,600 Buffalo residents, about 9.5 percent of the city's population, had ancestors from Poland, according to the 2015 American Community Survey. About 50 people gathered for an opening ceremony before the parade, at which Buffalo Mayor Byron W. Brown declared it "Anna Maria Anders Day." Erie County Sheriff Timothy B. Howard presented her with an award and named her an honorary sheriff. He assured, with a chuckle, that she would get her badge later in the day. The Buffalo News spoke with Anders prior to her kicking off the celebration. Her responses have been edited for length and clarity. Why did you decide to come out to the parade today? I got this invitation probably around eight or nine months ago to be the honorary grand marshal here. I was the honorary grand marshal at the Pulaski Parade in New York last year. It was a fabulous experience, and you know, I support Polish people all over the world. This is a very patriotic occasion and it brings Polish people in the United States together, so I didn't hesitate. And I'm certainly not disappointed, it has been fantastic. I got off the plane yesterday. Buffalo, red and white. Niagara Falls, red and white. City Hall, red and white. Curtiss Hotel, red and white. I mean, what can I say? It's been fabulous. We've visited a couple of monuments here and it just shows the pride of the Polish people who are here. What do you think about having a day named after you? Were you surprised? Of course, of course. I get a day named after me, I get a Sheriff's award, it doesn't get much better than this. It's fantastic. What do you think about Poland's relationship with the United States and President Trump's recent visit? Fantastic. I think since the election it has gradually improved. There were concerns about Russia and NATO and so what, but his speech was fantastic, it was really good. It was a lot about history, which is important because there are people in the world who don't really know Polish history. He spoke about history, he spoke about unity. There was a fear that it was going to be divisive. It was not divisive, it was really the west standing together against terrorism and enemies such as North Korea. It was very good, it really reassured Poland that they're a strong ally.